Promote your message on a beautiful scenic hand fan. 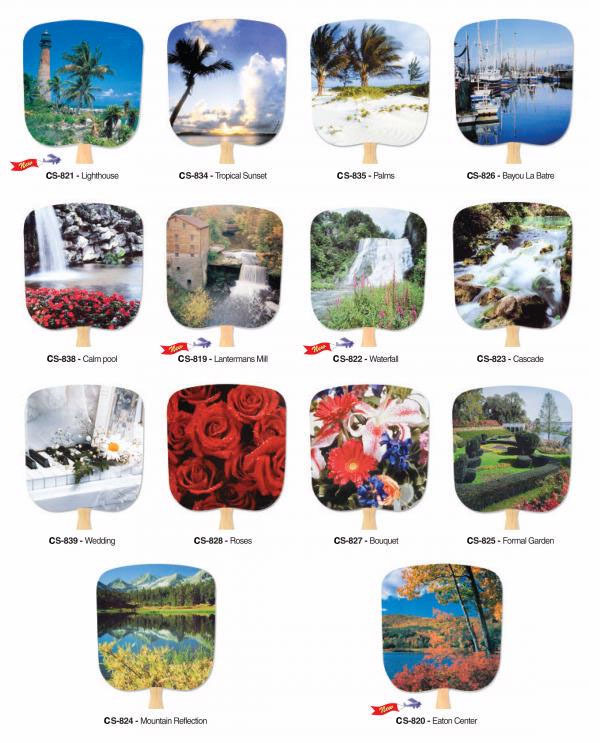 These hand fans feature an a variety of stock images such as landscapes, beaches, floral arrangements, waterfalls, gardens, boats, and more. Custom printed scenic hand fans work well for events like weddings, conventions, concerts, fundraisers, grand openings, outdoor parties, and more. Use them to promote your business or event for a low price by custom printing a name, date, or custom graphic on the scenic hand fan. Promotional scenic hand fans have a large imprint area and will get your business noticed and keep your guests cool.